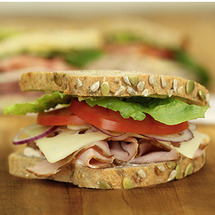 We offer Signature Sandwiches or Build Your Own Sandwiches that allow you to pick the perfect ingredients for you! Add cookies and chips for a boxed lunch. Just $2.00 more for either a whole or half. Please note that we are happy to take your order over the phone and have it ready for you to pick-up. We no longer have a fax machine, so please be sure to call in your order at 503-466-1112! CATERING GUIDE GREAT FOR MEETINGS! Delivery available for $10.00 within 5 miles. For Orders of 10 or more, please call ahead to 503-466-1112 or e-mail greatharvesthillsboro@gmail.com. Please note you should follow-up with a phone call after e-mail to ensure your order was received. Ham, Swiss cheese, mayo, mustard, green leaf lettuce, tomatoes and red onion. 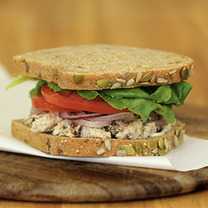 Chicken salad with sweet and spicy pecans, mayo, green leaf lettuce, tomatoes and red onion. 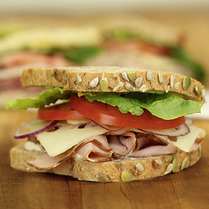 Turkey, Tillamook cheddar, mayo, mustard, green leaf lettuce, tomatoes and red onion.